After a year of mostly moving higher, with barely any volatility to speak of, we’re finally seeing a shift in the financial markets. It’s not just stocks – bonds, commodities, and currencies are also moving into new territories. Of course, much of the change is due to the expected change in interest rates and inflation (which are directly linked). It’s been several years since we’ve had any substantial changes in interest rate expectations. The arrival of higher rates is certainly inducing a sea of change to the financial markets. Now, not every change to the market is going to be as extreme as the selloff we experienced at the beginning of February. The volatility spike was especially nasty (and probably way overdone). But, sometimes it’s a major event like the early February correction which begins a longer-term trend. The trend in bond prices hasn’t exactly been subtle either, although it’s not as extreme as the move in stocks and volatility. 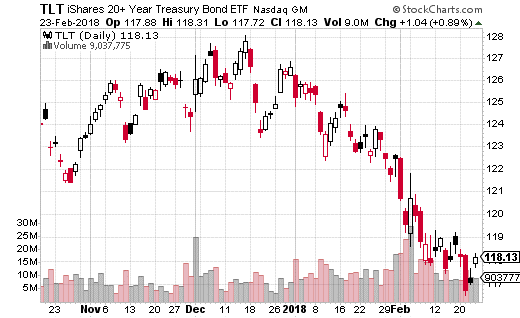 You can see in the chart below of iShares 20+ Year Treasury ETF (NASDAQ: TLT), that long bonds have been in steady decline since the start of the year. Keep in mind, bond prices and interest rates move inversely. So, if rates are expected to continue going up, then bond prices should also continue selling off. Subsequently, some big traders apparently think bond prices have a lot farther to fall. There’s been a lot of big options action in TLT this past week. In one trade, a buyer grabbed 15,000 March 16th 115 TLT puts for $0.62 with the stock just above $117. That’s a $930,000 bet that TLT will drop to at least $114.38 by March expiration. In another similar trade, the trader bought 10,000 March 16th 116 puts for $0.84. That works out to $840,000 in premium with a breakeven point of $115.16. Those are just a couple of the trades I saw betting on TLT’s downside. Clearly, there’s a lot of money being spent on a potential big down move in bond prices. Given what we’ve seen with CPI data, employment numbers, and corporate results, I tend to agree that bonds are going to keep going down (while interest rates go higher). I also think TLT is one of the cheaper ways to bet on higher interest rates. However, I wouldn’t necessarily purchase naked puts in TLT either. You can save some decent premium costs by using put spreads as an alternative. For instance, the March 16th 115-117 put spread (buying the 117 puts while selling the 115 puts) only costs $0.80, with TLT stock just over $117. Your breakeven on this trade is $116.20, while your max gain is $1.20. For only $0.80 you can potentially earn 150% returns if TLT keeps moving down. It’s a smart way to bet on higher interest rates without spending a ton of cash. One stock is all you need. And it’s not a blue chip stock like Wal-Mart. 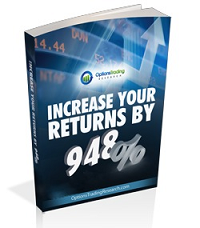 Over your entire retirement, you should see over $1 million hit your bank account thanks to this stock. 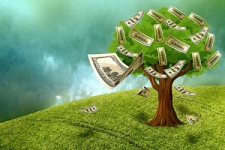 If you’re serious about a retirement with less financial worries, this #1 stock is your secret weapon. The first payout of the $1 million is days away. Click here before you miss the window.